One of the requirements of all Museum Studies minors is to pursue a 3-credit internship at one of the many museum-related institutions in our area or beyond. This experience is one of the defining moments in a student’s career at UMW, and often leads to future job opportunities or graduate school. During the summer of 2018, between my freshman and sophomore year, I interned at the George C. Marshall House in Leesburg, Virginia. General Marshall’s 200-year-old home is open to the public as a historic house museum and serves as a reminder of how one of America’s greatest patriots lived and found relief from wartime stress. As an intern, I served as the Director of Museum Operations and oversaw not only the house museum itself, but the volunteer docent staff and tour scheduling as well. The experience gained from this once-in-a-lifetime opportunity has helped deepen my love of history, art, museum collections, and General Marshall himself. My duties included interpreting the historic landscape of both the house and the grounds to the public, designing interactive exhibits, including one for the 70th anniversary of the Marshall Plan; planning events, and even creating an archive from scratch! The small size of the museum allowed me to try my hand at a number of different projects, which made my time there all the more rewarding. My goal was to change the way the public saw a House Museum. I sought to bring General Marshall’s legacy to the forefront of the community’s mind by removing stanchions along the tour path, asking visitors to critique tour operations, emphasizing community outreach, improving social media presence, and focusing on the visitor experience. I am excited to use what I learn to continue my studies at the University of Mary Washington and learn even more! It is hard to describe my excitement upon reading the email offering me a summer internship at the Smithsonian National Museum of African American History and Culture (NMAAHC) in Washington DC. Ever since declaring my minor in museum studies, I had the goal of interning at the Smithsonian before graduating from college. I started small by first completing three internships at local museums so I had a fighting chance at receiving a Smithsonian internship, which are highly competitive, particularly during the summer. My strategy worked well and I was elated to find out that I was offered an internship at the newest Smithsonian museum, where I could not even get tickets to go as a visitor! This is how, during the summer before my senior year, I joined the Public Programs Department team at NMAAHC. This kind of museum work was new to me. I got to help with the final touches on the program “The Newark Rebellion of 1967: A Historic Moment Considered,” a series of panel discussions that was a huge hit with the public, given the 300+ visitors in attendance. However, my biggest accomplishment would have to be that of creating a hands-on activity for visitors of an exhibition including a timeline of slavery. I worked with designers at the museum and it was amazing to see my ideas come to life through the design process! Above all, I had the chance to see how what I learned in all my museum studies classes comes together in a real museum, especially because public programs incorporate design, marketing, PR, education, and many other aspects. It is one thing to read or talk about these and it is another to really see them in action. This internship gave me an opportunity to learn more not only about museum work but also African American history and culture. I feel more appreciative of both, but know I still have more to learn. I spent the summer before my last semester at the University of Mary Washington interning for the Education Department at the National Museum of the Marine Corps (NMMC). I would say this internship was the highlight of my summer and every day at work I did what I love. As a new intern, I was first introduced to all of the other departments and later I had the chance to collaborate with staff members from the entire museum. I also had the honor to meet the director and deputy director of the organization. My duties were diverse but very enjoyable. Primarily, I assisted the summer camps at the museum. Interacting with camp participants of different ages was very rewarding and getting thank-you cards from campers always made my day. I also conducted research for “discovery carts, “ which are small collections of objects to present to visitors along with scripts that interpret those objects for enhancement of knowledge and experience. Last but not least, I served as the designated photographer of the summer camps and the pictures I took will be featured in promotional materials and on social media. In the presentation I gave to staff members at the end of the internship I expressed my gratitude for the learning opportunity I was given. My interest in museum education stems from a class on this topic I took in my junior year at UMW and this internship in the Education Department at NMMC definitely helped me make the decision to enter this field. 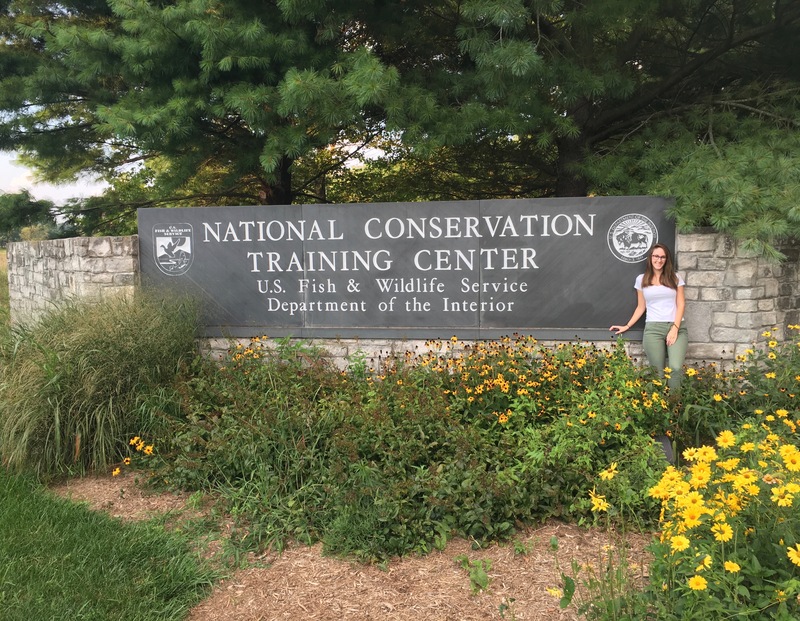 The summer in between my junior and senior years at the University of Mary Washington, I had the opportunity to intern with the United States Fish and Wildlife Service (USFWS) at the National Conservation Training Center in Shepherdstown, West Virginia. The Museum and Archives Center on campus houses approximately 500,000 items dating back to the 1850s. The items relate to the American conservation movement and the history of wildlife management in the United States. During my internship, I mostly focused on accessioning and cataloging new items into the archives, inventorying historic objects, photographs, and papers, and digitizing the USFWS historic film collection. Although museum and archive staff were always there to answer any questions I may have had, they trusted me to do the work on my own, which made me feel confident my abilities. Being able to touch, handle, and look at historic objects is such a spiritual experience and working with so many artifacts made this internship amazing. Not only did I get to learn more about the daily routine of a museum/archive and the U.S. conservation movement and wildlife management history, but I was also able to build professional relationships with all the staff, especially with the Chief Curator and Chief Historian. To conclude, this internship solidified dreams to work in a museum/archive in the future. I am so glad I decided to study Historic Preservation and Museum Studies here at UMW because there really isn’t anything else like working with objects that are 150 years older than you! My experience at the Manassas Museums System during the summer before my junior year was a fantastic opportunity for me to serve the community that I am a part of as a local. Working at a museum so close to my hometown helped me learn things I didn’t know about the place where I have lived for most of my life. My internship was in the education field, which allowed me to share my enthusiasm for history with every visitor I encountered. The small size of the museum was perfect for beginning my professional career and it benefited me greatly. The nature of many of the tasks I was assigned was new to me but, overall, the work strengthened my communication, social, and professional skills. I spent most of my time assisting with education programs, from the weekly booth we had at the Manassas Farmers Market with fun activities for children, to a large field-trip group of over 2,000 students from Tennessee that challenged us to figure out the logistics of fitting that many visitors on the Manassas Battlefields. Throughout the summer I was tasked with giving numerous tours and even got the chance to create a children’s program for a major local event, the Civil War Weekend. The latter allowed me to expand upon the knowledge I had obtained in my Museum Education course I took during the previous spring semester. This internship helped me better understand the museum field and grow as a young professional. I spent the summer between my sophomore and junior year completing what can only be classified as “My Dream Internship.” In conjunction with the National Museum of the Marine Corps (NMMC) and the Marine Corps Heritage Foundation, my internship took place at Marine Barracks in Washington D.C. The overall goal for my internship was to help the United States Marine Band research and catalog hundreds of items in their holdings that would become a part of the NMMC’s collection. Throughout the summer, I cataloged over two hundred objects, ranging from musical instruments and uniforms, to miscellaneous items like cigars and toasting glasses. Cataloging for the NMMC included creating an acquisition report complete with information about the object, its donor, and photos of the object now and when it was used. Because the Marine Band had such a wide array of objects, the research portion of the cataloging process was the most difficult, yet most rewarding, part of my internship. In addition to these reports, I also assisted with tours of the Marine Band Library and presented my acquisition reports before the NMMC Collections Committee at their monthly meetings. The skills I learned in this process will be beneficial not only in my future professional career, but also during the rest of my academic training at UMW. As a long-time musician, the decision to not major in music at UMW was not easy to make. I knew in my heart that a career in the museum field is what I have always wanted, so I chose to follow that instinct. This internship allowed me to combine my two passions for music and museums and hone the skills I have already learned as a historic preservation major. I will be forever grateful for the National Museum of the Marine Corps, the Marine Corps Heritage Foundation, and the United States Marine Band for making a few of my dreams come true.